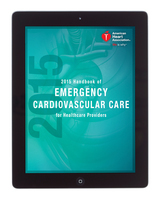 The 2015 eHandbook of ECC for Healthcare Providers is the eBook version of the AHA’s printed 2015 Handbook of ECC for Healthcare Providers. This quick reference tool incorporates the latest science and treatment recommendations from the 2015 AHA Guidelines Update for CPR and ECC. It provides convenient access to the latest resuscitation science and treatment information. Organized by basic life support, advanced cardiovascular life support, newborn resuscitation and pediatric advanced life support, it includes algorithms, protocols, sequences, and drug dosages. 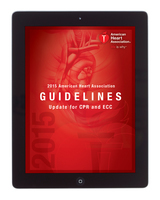 This is the eBook version of the 2015 AHA Guidelines Update for CPR and ECC — the AHA’s cornerstone scientific text. Updated guidelines reflect new global resuscitation science and treatment recommendations derived from the 2015 International Consensus on CPR and Emergency Cardiovascular Care with Treatment Recommendations (CoSTR). The BLS Instructor Manual includes essential information and Lesson Plans that AHA BLS Instructors need to teach BLS courses, including the classroom and the blended learning versions. Please note: Because this tool is electronic, there are no separate supplementary tools included through the eBook Store (e.g., reference cards, guides). All supplementary tools included with the printed version (e.g., Instructor Manual CD) are accessible electronically through the AHA Instructor Network (link to www.ahainstructornetwork.org). NOTE: The BLS Instructor Manual eBook is for use by AHA BLS Instructors. Each Instructor must have his/her own copy of the Instructor Manual (in print or digital format) for teaching the BLS Course. The BLS Provider Manual contains all of the information students need to know to successfully complete the BLS Course. The BLS Provider Manual is designed for use by a single user and as a student reference tool pre- and post-course. It includes information on single-rescuer and team basic life support skills for application in both in-facility and prehospital settings; emergency recognition; adult, child and infant rescue techniques; high-quality CPR; AED use; and relief of choking. 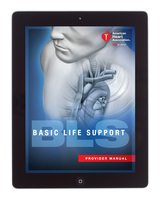 A separate supplementary tool, the BLS Digital Reference Card, is included with the purchase of the BLS Provider Manual eBook. This reference card is the electronic equivalent of the BLS Reference Card. NOTE: Prior to purchasing an AHA eBook for a classroom-based course, students should check with their Instructor or Instructor’s Training Center Coordinator to ensure that mobile devices will be allowed in the classroom. The International English (IVE) version of the Basic Life Support (BLS ) Provider Manual is adapted for training outside the United States and Canada. IVE training materials have been updated to include metric units of measure and other references that do not apply to students in the U.S. and Canada. The BLS Provider Manual contains all of the information students need to know to successfully complete the BLS Course . The BLS Provider Manual is designed for use by a single user and as a student reference tool pre- and post-course. It includes information on single-rescuer and team basic life support skills for application in both in-facility and prehospital settings; emergency recognition; adult, child and infant rescue techniques; high-quality CPR; AED use; and relief of choking. Please note, there is a separate supplementary tool included, the BLS Digital Reference Card. This is the electronic equivalent of the BLS Reference Card, and will be automatically included with the purchase of the BLS Provider Manual eBook. Note : Prior to purchasing an AHA eBook for a classroom-based course, students should check with their Instructor or Instructor’s Training Center Coordinator to ensure that mobile devices will be allowed in the classroom. The ACLS Instructor Manual includes essential information and Lesson Plans that AHA ACLS Instructors need to teach ACLS courses, including the classroom and the blended learning versions. Please note: Because this tool is electronic, there are no separate supplementary tools included through the eBook Store (e.g., reference cards, guides). All supplementary tools included with the printed version (e.g., Instructor Manual CD) are accessible electronically through the AHA Instructor Network (link to www.ahainstructornetwork.org). NOTE: The ACLS Instructor Manual eBook is for use by AHA ACLS Instructors. Each Instructor must have his/her own copy of the Instructor Manual (in print or digital format) for teaching the ACLS Course. O e-Manual 2015 de ACE para Profissionais de Saúde é a versão eletrônica do Manual 2015 de ACE para Profissionais de Saúde impresso da AHA. Esta ferramenta de referência rápida inclui as descobertas científicas e as recomendações de tratamento mais recentes presentes na Atualização das Diretrizes da AHA 2015 para RCP e ACE. Ele oferece um acesso conveniente a informações atualizadas sobre ressuscitação e tratamentos. Organizado para suporte básico de vida, suporte avançado de vida cardiovascular, ressuscitação de recém-nascidos e suporte pediátrico avançado de vida, ele traz algoritmos, protocolos, sequências e dosagens de medicamentos. The ACLS Provider Manual contains all of the information students need to know to successfully complete the ACLS Course. The ACLS Provider Manual is designed for use by a single user and as a student reference tool pre- and post-course. It is also used as a clinical reference. This manual includes the systematic approach to a cardiopulmonary emergency, effective team communication and the ACLS cases and algorithms. Topics covered include the importance of continuous, high-quality CPR; team dynamics and communication; systems of care; immediate post-cardiac arrest care; airway management; and related pharmacology. This manual also gives students access to a website containing additional information and reference materials to help them successfully complete the course. 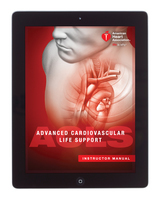 A separate supplementary tool, the ACLS Digital Reference Card Set, is included with the purchase of the ACLS Provider Manual eBook. This reference card set is the electronic equivalent of the ACLS Reference Card Set. NOTE: Prior to purchasing an AHA eBook for a classroom-based course, students should check with their Instructor or Instructor’s Training Center Coordinator to ensure that mobile devices will be allowed in the classroom. El Libro de bolsillo electrónico de ACE de 2015 para profesionales de la salud es la versión electrónica del Libro de bolsillo de ACE de 2015 para profesionales de la salud impreso. Se trata de una herramienta de referencia rápida que incorpora los últimos avances científicos y las recomendaciones de tratamiento de la Actualización de las guías de la AHA de 2015 para RCP y ACE. Permite acceder con comodidad a la información más actualizada sobre tratamientos y ciencia de reanimación. El contenido está organizado en soporte vital básico, soporte vital cardiovascular avanzado, reanimación neonatal y soporte vital avanzado pediátrico, e incluye algoritmos, protocolos, secuencias y posologías. The International English (IVE) version of the Advanced Cardiovascular Life Support (ACLS) Provider Manual is adapted for training outside the United States and Canada. IVE training materials have been updated to include metric units of measure and other references that do not apply to students in the U.S. and Canada. The ACLS Provider Manual contains all of the information students need to know to successfully complete the ACLS Course. The ACLS Provider Manual is designed for use by a single user and as a student reference tool pre- and post-course. It is also used as a clinical reference. 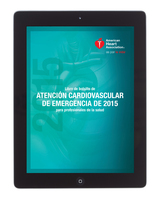 This manual includes the systematic approach to a cardiopulmonary emergency, effective team communication and the ACLS cases and algorithms. Topics covered include the importance of continuous, high-quality CPR; team dynamics and communication; systems of care; immediate post-cardiac arrest care; airway management; and related pharmacology. This manual also gives students access to a website containing additional information and reference materials to help them successfully complete the course. A separate supplementary tool, the ACLS Digital Reference Card Set, is included with the purchase of the ACLS Provider Manual eBook. This reference card set is the electronic equivalent of the ACLS Reference Card Set. NOTE: Prior to purchasing an AHA eBook for a classroom-based course, students should check with their Instructor or Instructor’s Training Center Coordinator to ensure that mobile devices will be allowed in the classroom. Il Manuale ebook 2015 di trattamento delle emergenze cardiovascolari per operatori sanitari è la versione elettronica del Manuale 2015 di trattamento delle emergenze cardiovascolari per operatori sanitari cartaceo dell'American Heart Association. Questo strumento di riferimento rapido contiene le ultime raccomandazioni scientifiche e i trattamenti presenti nell'Aggiornamento delle Linee Guida AHA 2015 per RCP ed ECC. Fornisce un utile accesso alle ultime informazioni scientifiche riguardo i trattamenti e la rianimazione. È diviso in supporto vitale di base, supporto vitale cardiovascolare avanzato, rianimazione neonatale e supporto vitale avanzato pediatrico ed include algoritmi, protocolli, sequenze e dosaggi dei farmaci. 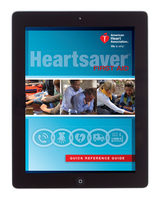 The Heartsaver First Aid Digital Quick Reference Guide provides critical first aid information for adults in an easily accessible, simple format. It includes signs for several first aid emergencies (""What you see"") and the actions to take in those emergencies (""What you do""). The guide covers checking the victim, choking, severe allergic reaction, heart attack, stroke, seizures, shock, external bleeding, tourniquets and adult CPR and AED. The guide can be used by students before, during, and after their first aid courses. 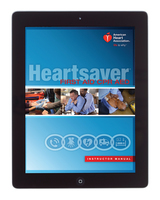 The Heartsaver First Aid CPR AED Instructor Manual eBook includes essential information and Lesson Plans that AHA BLS and Heartsaver Instructors need to teach AHA's Heartsaver courses, including the classroom and blended learning versions. Please note, because this tool is electronic, there are no separate supplementary tools (e.g. reference guide, reminder cards). All supplementary tools included with the printed version (i.e. Instructor Manual CD) are electronically accessible via the AHA Instructor Network (www.ahainstructornetwork.org) The Heartsaver Instructor Manual eBook is for use by AHA BLS and Heartsaver Instructors. Each Instructor must have his/her own copy of the Instructor Manual (print or digital format) for teaching the Heartsaver course. The Heartsaver First Aid CPR AED Student eBook contains all the information students need to know to successfully complete the Heartsaver First Aid CPR AED course. The workbook includes information on First Aid Basics, Medical, Injury and Environmental Emergencies, Preventing Illness and Injury, Adult and Child CPR AED Use, Infant CPR and Helping with an Opiod-Associated Life Threatening Emergency. The Heartsaver First Aid CPR AED Student Workbook is for use by a single user as a student reference tool before, during, and after the course. 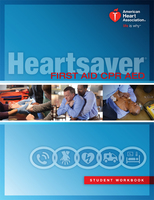 Supplementary tools include the Heartsaver First Aid Digital Quick Reference Guide, Adult CPR AED Reminder eCard and Child and Infant CPR AED Reminder eCard and are included with the purchase of the Heartsaver First Aid CPR AED Student eBook.